Thank you for your question, you can order online or by calling 0161 968 5994 unfortunately as resellers of items we do not have the specific dimensions of the box or weight of the box. The Epson Aculaser C3800 is an impressive colour laser printer and one of the fastest in its class at 25ppm for mono or 20ppm for colour. The Aculaser C3800 achieves photo quality colour output thanks to a maximum resolution of 4800 RIT. Printing from your Aculaser C3800 is a relaxing experience thanks to incredibly quiet operation but what happens when you run out of Epson Aculaser C3800 toner cartridges? Suddenly you start to panic and rush out to find Epson Aculaser C-3800 toners at your local electronics store. Unfortunately they don't appear to sell any toner for the Espon Aculaser C3800 so you move on to the local computer hardware store. Now you find that the Espon toners they are selling are so high in price that you haven't got enough cash with you to buy them, even if they had your cartridge in stock. Here at Cartridge Save you can avoid this typical but frustrating experience by choosing from our range of cheap Epson Aculaser C3800 cartridges that you are able to order from the comfort of your own home or business at the click of your mouse. Better still, we offer you next day delivery so you don't even have to wait around to enjoy our price discounts on Epson toner meaning your laser printer never needs to be out of action. If you have bought our Epson toner cartridges before you will be well aware that our free next day delivery means we are cheaper on price than other online stores. To underline our commitment to customer satisfaction every single Epson Aculaser C 3800 toner we sell comes complete with a money back guarantee. Now you can experience true Epson print quality for a lot less than you would normally expect so don't miss out. Place your order in the capable hands of our award winning customer service team and start saving money today at Cartridge Save. Aimed at small and medium workgroups, the Epson AcuLaser C3800 strives to be an economical printer for businesses that need a secure, reliable, and fast laser printer for their basic printing requirements. The AcuLaser C3800 printer features an advanced graphics interface for user-friendly operation, as well as direct-printing capabilities for more convenience, but budget-conscious departments might look elsewhere because of the exorbitant cost. This colour laser printer is fairly compact, slightly heavy, but sturdy, making it a workhorse for small to medium workgroups. The Epson C3800 runs on 128MB of memory with a powerful processor, and comes with Ethernet and high-speed USB 2.0 connectivity options. The Epson AcuLaser C3800 A4 colour laser printer is shaped like a box, with the control panel on the top right-hand side. The display screen displays concise and live status along with helpful tips for users so they can immediately fix occasional issues like low ink levels and print errors. Monochrome and colour printing are reasonably fast, and it is easy to operate the Epson AcuLaser C3800 because of the backlit, fairly large, and graphics-friendly display screen on the control panel. A workgroup can share the C3800 via Ethernet and configure it for utmost security. The memory is upgradeable to 1GB. 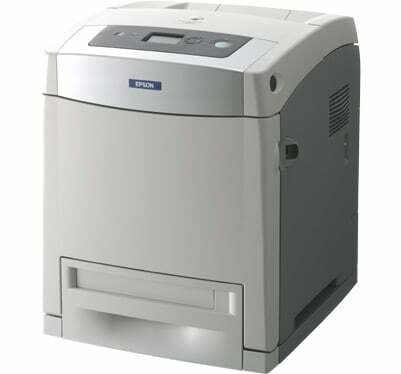 Users can print directly with the Epson AcuLaser C3800 laser printer from a USB key. Output looks sharp and vibrant in high 4800dpi resolution. High capacity toner cartridges help users save money. The Epson AcuLaser C3800 colour laser printer is expensive and ink cartridges are pricey. Users need to spend more for the Epson AcuLaser C-3800 if they want to upgrade the standard memory so it will run faster when processing complicated print jobs.